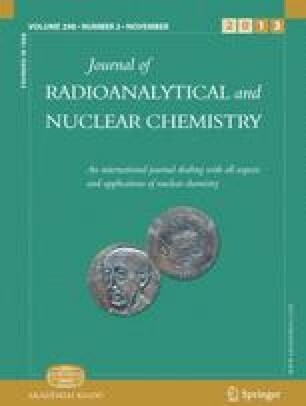 A new method for the determination of radiostrontium in seawater samples has been developed at the Savannah River National Laboratory (SRNL) that allows rapid pre-concentration and separation of strontium and yttrium isotopes in seawater samples for measurement. The new SRNL method employs a novel and effective pre-concentration step that utilizes a blend of calcium phosphate with iron hydroxide to collect both strontium and yttrium rapidly from the seawater matrix with enhanced chemical yields. The pre-concentration steps, in combination with rapid Sr Resin and DGA Resin cartridge separation options using vacuum box technology, allow seawater samples up to 10 L to be analyzed. The total 89Sr + 90Sr activity may be determined by gas flow proportional counting and recounted after ingrowth of 90Y to differentiate 89Sr from 90Sr. Gas flow proportional counting provides a lower method detection limit than liquid scintillation or Cerenkov counting and allows simultaneous counting of samples. Simultaneous counting allows for longer count times and lower method detection limits without handling very large aliquots of seawater. Seawater samples up to 6 L may be analyzed using Sr Resin for 89Sr and 90Sr with a minimum detectable activity (MDA) of 1–10 mBq/L, depending on count times. Seawater samples up to 10 L may be analyzed for 90Sr using a DGA Resin method via collection and purification of 90Y only. If 89Sr and other fission products are present, then 91Y (beta energy 1.55 MeV, 58.5 day half-life) is also likely to be present. 91Y interferes with attempts to collect 90Y directly from the seawater sample without initial purification of Sr isotopes first and 90Y ingrowth. The DGA Resin option can be used to determine 90Sr, and if 91Y is also present, an ingrowth option with using DGA Resin again to collect 90Y can be performed. An MDA for 90Sr of <1 mBq/L for an 8 h count may be obtained using 10 L seawater sample aliquots. This work was performed under the auspices of the Department of Energy, DOE Contract No. DE-AC09-96SR18500.